Traditional marketing matured between 1950 and 1980, then held sway until recently. Telephone surveys (research ), management consultancies (corporate planning), and broadcast media (advertising) have dominated market budget expenditures until the past year. 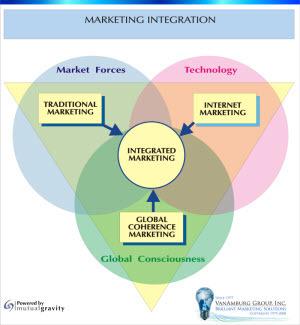 Global Coherence Marketing recognizes what scientists have recently discovered through quantum physics, that everything is connected, and every action we take as investors and business managers has an immediate and global impact. When we can no longer dump our garbage at sea and expect it to disappear, we take responsibility for it. Traditional and Internet marketing will complete their integration in the next few years as old school marketers refusing to adapt to technology retire and new school marketers learn from the decades of offline marketing experience. The changes being forced upon us through financial, economic, ecological and energy transition will have lifelong impact on our perceptions of economic reality. As information in every sector becomes more transparent in the coming decade, we will reach a tipping point where marketing will become extended personal communications among trusted friends sharing information for the common good. Businesses providing life supporting products and services will become dominant, and Global Coherence Marketing will emerge as predominant. VanAmburg Group works with and supports those businesses.